Among various chronic diseases, cancer is one of the most dreaded diseases throughout the world. Despite dramatic improvements in surgical and reconstructive techniques, the overall mortality rates for cancer remain relatively unchanged. To date, numerous screening and preventive approaches have been directed towards cancer, which clearly reflect a decrease in the morbidity and mortality associated with cancer. The screening measures include physical exam and history, laboratory tests, imaging and genetic tests on timely basis. However, primary prevention of cancer is more important to keep cancer away from developing. This includes maintaining a healthy lifestyle and avoiding exposure to known cancer-causing substances. Thus cancer risk can be reduced with healthy choices like avoiding tobacco, limiting alcohol use, protecting skin from the sun and avoiding indoor tanning, eating a diet rich in fruits and vegetables, keeping a healthy weight, and being physically active. Lifestyle plays an important role in the prevention of this disease. By adopting a diet consisting primarily of whole grains, fruits and vegetables with limited amounts of meat, primarily chicken or cold-water fish, and doing daily exercise, several risk factors can be avoided. Various methods are available for the treatment of cancers and the selection will depend on the cost, morbidity, requirement of reliable biopsy specimens, resources available, etc. Thus management of cancer by self-care could be a great potential to improve detection and the treatment of cancer; morbidity and mortality also will decrease as a result. The field has broad and wide applications and with every new development reported in leading peer-reviewed journals across the globe, the opportunities only become wider and the hopes brighter. 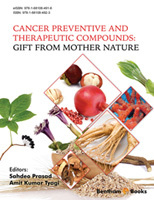 The editors Dr. Sahdeo Prasad and Dr. Amit Tyagi have done an excellent job of bringing out timely peer-reviewed chapters under the banner "Cancer Preventive and Therapeutic Compounds: Gift From Mother Nature" with contributors spreading across four different continents. I complement the authors and appreciate their efforts in bringing out this comprehensive compilation. It is quite impressive to note that the editors have tried to capture such a wide and dynamic topic in a series of attractive articles highlighting different forms of cancer prevention and treatment research, both existing and newly emerging technologies in the field, approaches, advantages, thoughts from around the world along with potential future prospects. The simplicity of the language and presentation style is very much appealing and impressive. It is my great pleasure to pen down/write the foreword for this prestigious, multi-authored book compilation withpeer-reviewed chapters. This book will be a valuable resource for the scientists and students seeking updated and critical information for their experimental plans. It will be very useful for the clinician to develop clinical trials using natural compounds with or without existing therapeutic drugs. Pharmaceutical companies could design new formulations based on the literature available in this new book. Most importantly, normal population and cancer patients can be benefited by knowing the preventive and therapeutic efficacy of natural compounds. They can use these natural compounds in their routine life. This book could be a major breakthrough worldwide for the readers, particularly the cancer patients. Cancer is one of the leading causes of deaths around the world and it is globally increasing. The highest incidence rates are in the developed countries such as the USA, and the lowest rates are found in developing countries. These differences in incidence rates appear to be attributable to geographical differences in diet and environmental exposure. Although environmental and genetic factors are the major risk factors for cancer, lifestyle also contributes to the development of this disease. Although screening modalities for early detection and therapeutic management of cancer have improved considerably, this disease still needs better treatment modalities. Since long-term use of cytotoxic chemotherapy and radiotherapy can have severe side effects and since tumors can develop resistance to these therapies, agents that can overcome tumor resistance, enhance the therapeutic efficacy of existing drugs and can control multiple signaling pathways are needed to treat cancer. Although numerous anticancer drugs are available, most of them are expensive and have serious side effects. Thus, the challenging task of finding an alternative cancer treatment measure has become more important than ever to both scientists and physicians. Since natural compounds have been identified and explored for their health benefits for centuries, several nutritional factors have attracted considerable attention as modifiable risk factors in the prevention and treatment of cancer. Natural products are important sources of anti-cancer lead molecules; even many successful anti-cancer drugs approved by FDA are natural products or their derivatives. Still many more are under clinical trials. Based on the current available research, the present book will focus on the chemopreventive and anti-cancer activities of different natural/dietary compounds such as fruits, vegetable, spices, legumes, nuts, grains, and cereals highlighting their potential use against cancer treatment. Since these natural compounds including fruits and vegetables contain a wide variety of phytochemicals, they may have anti-carcinogenic effects. Evidences showed that the phytochemicals present in fruits and vegetables modulate large numbers of cell signaling molecules linked with cancer. The modulation of signaling molecules controls the abnormal growth of cells and ultimately controls the growth of cancer. Also antioxidative and anti-inflammatory properties of natural compounds could hold promise for cancer chemoprevention because oxidative stress and chronic inflammation play important roles in cancer development. This book is the culmination of the efforts of several researchers, scientists, graduate students and post-doctoral fellows across the world. In this book authors focused on the role of natural compounds in the prevention and therapy of various cancers. The book has enormous scope and will benefit multiple audience including researchers, clinicians, patients, academicians, industrialists, and students. The editors are also thankful to Bentham Publisher and their team members for the opportunity to publish this book. Lastly we thank our family members for their love, support, encouragement and patience during the entire period of this work.